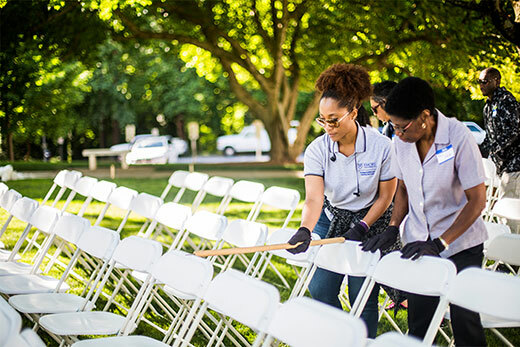 Emory staff members are invited to take part in the university's rich history of service to the graduating class, their families and guests by volunteering at Commencement. Opportunities begin Wednesday, May 3, with the annual "Chair Rodeo" from 9 a.m. to noon. Volunteers set up 14,000 chairs in rows on the Quadrangle and zip-tie them together. Lunch will be provided. The need for volunteers is critical on Commencement Day, Monday, May 8, when Emory welcomes thousands of guests and salutes the class of 2017. Opportunities include serving as ambassadors — recognizable by the iconic straw hats they wear — to answer questions, calm late students running across campus, and ensure that everyone is in the right place. Also needed are ushers who assist in the general and special-needs seating areas and volunteers for the information booth and program table who make sure that everyone has what they need to stay informed. Coca-Cola distribution volunteers see that everyone is hydrated. “This year we will have filtered water tanks on the Quadrangle and will be encouraging guests to bring their own refillable water bottles,” says Eden-Antola. Breakfast is provided for all volunteers on Commencement Day from 5:30 a.m. to 6 a.m. and lunch for those working until 2 p.m. The Chair Rodeo Breakdown is set for 1:30 p.m. to 3:30 p.m. when all chairs will be removed. Volunteers should register in advance for the times they are available to help. All volunteers who work a full shift will be entered in a drawing for a chance to win a $50 gift card. Contact Commencement volunteer organizers for more information. “We need volunteers across the board and in all areas,” she says.